On January 31st, the California Demand Management Coalition (CEDMC) held a workshop with attendance from a range of stakeholders including California utilities, implementers, and regulators, entitled EM&V: We Are All In This Together. Among a number of critical takeaways from the forum was the fact that California has started to measure and value energy efficiency impacts based on their metered resource curve impacts (i.e. the time and locational value, or change in load shape), rather than traditional kWh monthly savings and modeled demand impacts. This is enabling energy efficiency resource curves to function like a DER to solve time and locational grid problems incurred by decarbonization of supply. In a panel titled “From the Shadows to the Spotlight,” Adam Scheer of PG&E showed how PG&E is currently tracking load shapes and that demonstrates the value of these new capabilities (full presentations can be found here). This real-life example was an essential part of the broader panel discussion on transitioning from our current load shape data for forecasting (spotty and out of date according to CPUC staff panelists) to a more robust flow of actual data to support grid planning. Figure 1: Comparison of the resource curve (hourly savings) of the AHUP (Advanced Home Upgrade Program) residential whole building (home performance) vs. Commercial Deemed lighting programs. AHUP primarily saves energy in the late afternoon 4-8PM period, while Commercial Deemed delivers solid baseload reductions but peaks mid-day. This result makes intuitive sense, as you can’t save it unless you use it. 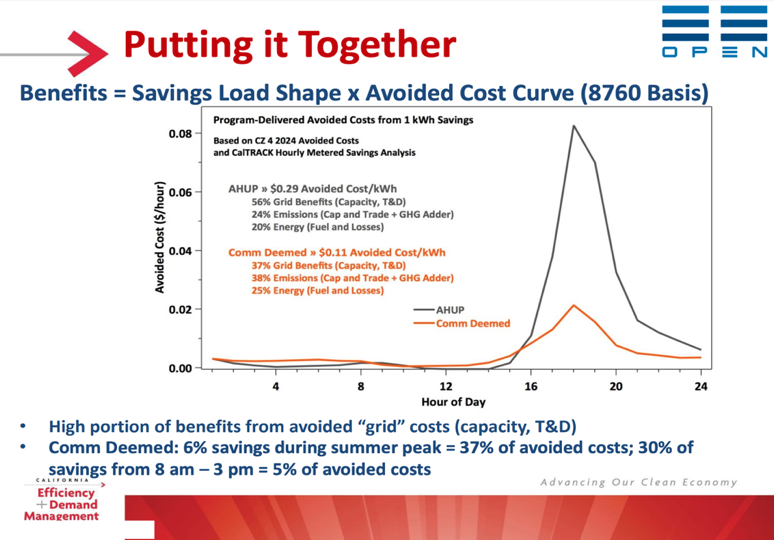 Figure 2: Focusing on the AHUP resource curve, PG&E further breaks down the savings shape into seasons and compares it to PG&E’s avoided cost value stack, which includes T&D, Energy, Capacity, RPS goals, and Carbon. 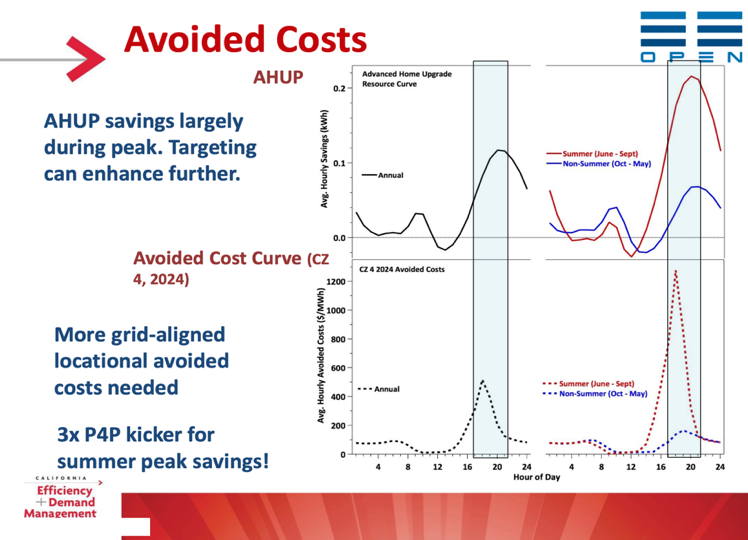 One can see that the AHUP peak savings window overlaps nicely with the system peak (aka neck and head of the duck); delivering greater value both to our current valuation structure and will be invaluable to quantification for direct grid procurement applications. 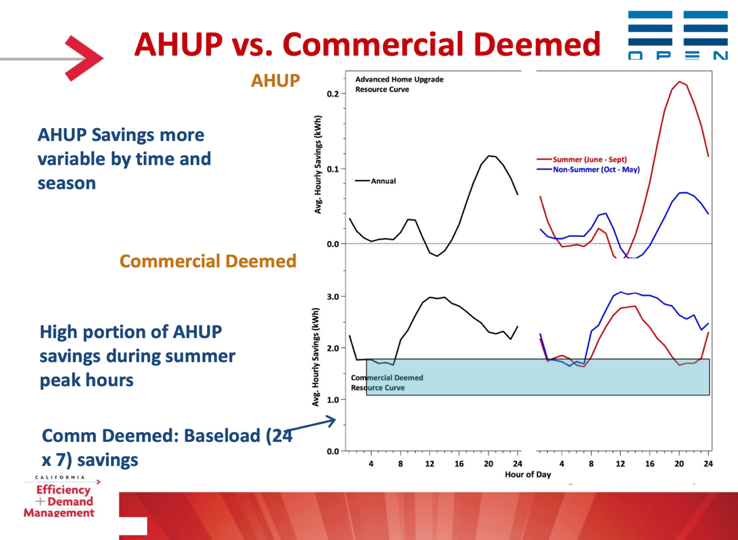 Figure 3: AHUP is nearly 3x as valuable per kWh when the hourly avoided cost is calculated vs savings from the Commercial Deemed program. 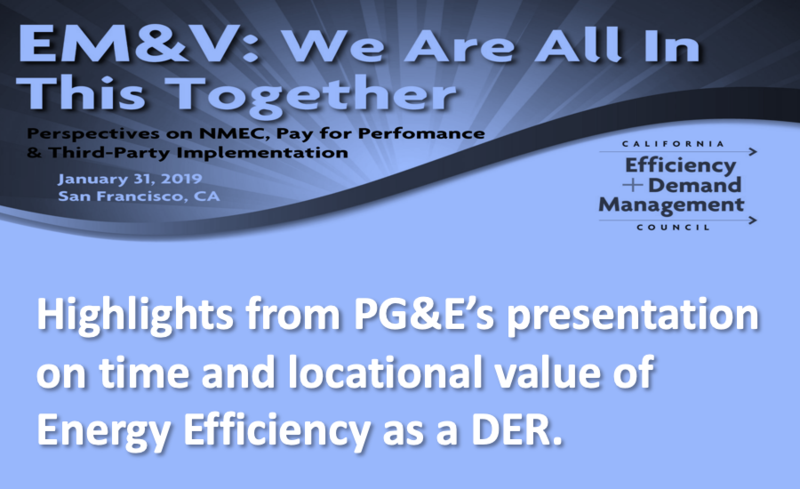 Earlier in the day, Leif Magnuson of PG&E presented a transition path to energy efficiency as a competitive DER, a theme that was common throughout presentations and discussions at the forum. 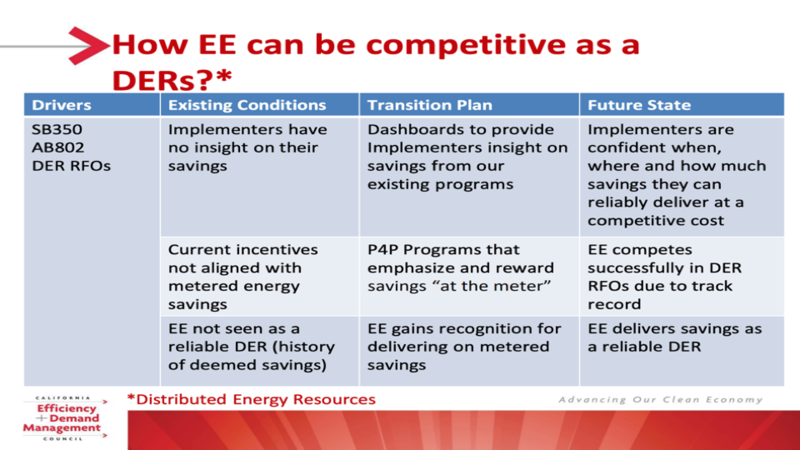 Figure 4: How moving to embedded metered resource curve (hour savings), combined with pay-for-performance at the meter results in EE as a reliable DER. 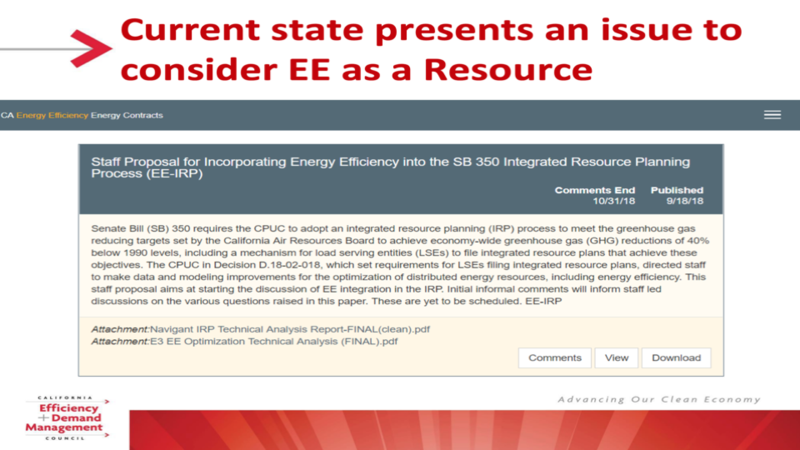 Figure 5: SB350, which doubles the State of California’s EE and Renewables goals, calls for the integration of EE as a resource into the IPR, and the CPUC is engaging stakeholders to find the best path forward. 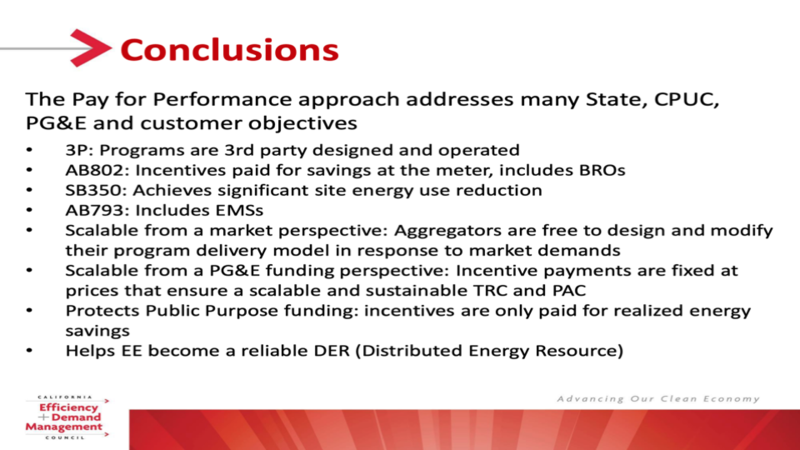 The joint statement of the California IOUs, lays out this paradigm shift clearly, stating that "the advent of Pay-for-Performance programs, the growth of on-bill financing offerings, market transformation initiatives, load shifting, and integrated DR strategies, among other new strategies, are all expected to play central roles in the upcoming EE portfolios, while the traditional measure-based deemed and custom interventions that serve as the foundation for the current EE Potential and Goals modeling are becoming less prevalent." OpenEE put in our own comments on how this integration could and should work. Feel free to give our take on the strategy and mechanics a read here. Figure 6: The combination of resource curve with pay-for-performance offers a scalable, cost-effective, market-based approach to delivering valuable impacts from energy efficiency as a reliable DER. The theme of possibility at the CEDMC forum EM&V: We Are All In This Together was palpable. PG&E, in presenting these slides, offered practical experiences and applications alongside many other presenters who offered their own experiences in working through these transitions. The full deck of slides can be found in total here. Learn more about Metered Energy Efficiency, Market Design, Pay-for-Performance, and how you can also know the hourly impact of your program or business model. Contact OpenEE to learn more.